People tend to see the material you use for comedy as a reflection of your personality. Learning the right material for the right audience can help you come off as funny without alienating or offending others. Context is key. Where is it you’re trying to be funny? Do you want to be the funny guy at work or school? Or are you looking to be the breakout sensation in your local improv troupe? Lighthearted, non-controversial material is best for a professional audience while laughing off slightly edgier subjects might win you favor in the world of professional comedy. Remember, what you joke about is a reflection of you. If you tend to mock recent tragedies or controversies, people may feel uncomfortable around you. 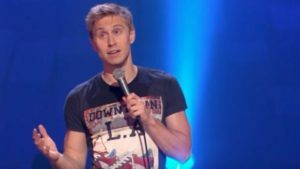 Being edgy can be a positive for a comedic career, of course, but if you’re new to comedy it might be best to stick with lighter subjects until you get the hang of making people laugh. Appropriate material can be found anywhere. People tend to appreciate those who find humor in a host of subjects. Try and see the funny side in aspects of day-to-day life. Anything from riding a bus to pouring your morning coffee can be used as fodder for humour. Immerse yourself in funny things. A great way to build your sense of humour is by exposing yourself to things that are funny. It’s hard to force being funny but you tend to unconsciously take on traits of media you view. Just like writers become better writers through reading, immersing yourself in humourous material can help hone your sense of humour. Watch funny clips of people online. Many YouTubers incorporate humour without explicitly telling jokes. Listen to funny podcasts and hang around people who enjoy laughing. Pay attention to people’s reactions. Observe how people react in day-to-day life. You can gauge the type of material people find funny by doing some basic people-watching. Go to a coffee shop and watch people banter with baristas. Attend an art show or concert alone and listen to people converse. Pay attention to lunch room interactions at work. See when and why people laugh. Do not force your humour. The funniest people do not force their funny side. They wait for an opportune moment to make a funny observation. The best moments of humour and levity do not happen by force. If you’re striving to be funny in day-to-day life, do not behave as if you’re at a comedy club. Engage with people in serious conversation and when you think of an amusing observation, feel free to throw it in. Just do not enter a conversation planning to make people laugh. Allow it to happen at its own pace. Use moderation. Most comedic experts adhere to the “Three Gag Rule.” That is, in any situation you should get in no more than three funny comments in a row. You do not want to look like an attention hog. A great way to be funny without joking is to tell funny stories. Did you have a funnier than average childhood? Did you have an awkward experience at prom in 11th grade? Do you have hilarious stories about you and your friends from college? Have a host of funny stories on queue to make people laugh. Try to think of the moments in your life that you laughed the most. Are these moments appropriate to share? Would others be amused? Try to think of funny stories to share with others. This is a great way to make people laugh without cracking a joke. Sometimes, how you tell a story is just as funny as the content of the story itself. Listen to podcasts like “This American Life” where people tell amusing anecdotes. Read David Sedaris essays and watch clips of his readings. Pay attention to how speakers tell the stories, where they pause, smile, and laugh themselves. Try to learn how to tell a story in an amusing. If you want to be funny without telling jokes, try simply being silly. Being a silly or goofy person can make people laugh. Play harmless pranks on friends and co-workers. Talk in a funny voice. Sing a silly song. Do not try to force silliness, however, as people tend to be annoyed at cultivated goofiness. Focus on things that are amusing to you. It’s easier to make people laugh if you’re using material that comes to you organically. Spend time around people who love to laugh. A great way to learn to be funny is to spend time around funny people. You’ll learn how to insert humour naturally into a situation through observation. Hang around friends, family members, and co-workers who have a reputation for having a great sense of humour. You don’t have to limit funniness to yourself. People tend to be drawn to those who bring out the humour around them. When in conversations, try to encourage people to embrace their own funny sides. Laugh at other people’s amusing stories and compliment them, saying something like, “That’s so funny!” People crave being around funny people but might feel annoyed if you always hog the spotlight. Make room for others. Make yourself a fun environment. If you want to be funny, surround yourself with funny things. Make a conscious effort to cultivate a fun environment for yourself. Keep objects in your home that remind you of fun times. Have a picture up from that hilarious road trip you took with your college friends. Tape up funny cartoons to your walls. Put up posters from funny television shows and movies. Put up an amusing screensaver on your computer or phone. Have appropriate but amusing magazine clippings and photos up in your office cubical. Children have fewer inhibitions than adults and often feel more free to express their silly side. Spending time with kids can help you lighten up and embrace your funny side. If your a parent, work on spending more time with your own kids laughing. If you have friends or relatives with young children, offer to babysit. Volunteer to work with children. Hospitals, nurseries, and daycare centers are always looking for volunteers. Incorporate downtime into your schedule. Between the business of work and other obligations, people often neglect downtime. Make a conscious effort to take some time every day to relax and laugh. Have a daily ritual where you allow yourself to laugh. Watch a funny movie or television show. Read the comics. Call up a friend who always makes you smile. Many people feel they don’t have time to laugh. However, people who make time for pleasure are actually more productive overall. You can also find ways to incorporate humour into your day-to-day activities. Listen to a funny podcast while commuting to work or exercising. Have a funny movie on in the background while you’re doing dishes at night. If you tend to watch intense dramas, you might have trouble seeing the levity in life. Try to make room for funny TV shows and movies. Ask friends for suggestions for funny shows. Read reviews online of the newest, funniest comedies. 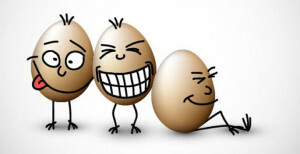 Hang around with your friends who you think have a great sense of humour. By spending more time with him, you can learn a lot from him/her. Don’t be afraid to poke fun at yourself. People often feel comfortable around those who have a self-depreciating sense of humour. Sarcasm can sometimes be hard to read so use it with discretion. You can use puns. For example, if someone says, “I love butter!”, you could say “You’d butter not!”. Keep it fresh. Staying on one subject can grow tiresome quickly; learn to flip to new topics to keep your humor fresh during an occasion of repartee! If you wait too long, even very funny comments will lose their impact. For example, if someone says something to you and you think of a witty comeback two hours later, you’re probably better off just keeping it to yourself. It won’t be funny anymore. Hand gestures and facial expressions help and can even make things funnier. What is funny has cultural overlays. Something funny in the USA may be perplexing in France, for example. Keep this in mind, and try to find universally shared funny stories. If someone from across the room starts looking at you while a test is happening, then throw a funny face while the teacher is not looking. This should make them laugh depending on their personality. Don’t laugh at your own jokes until everyone else is laughing. It will not only make it seem you’re trying too hard to be funny, but it can also spoil the funny moment and nobody else will feel inclined to laugh. 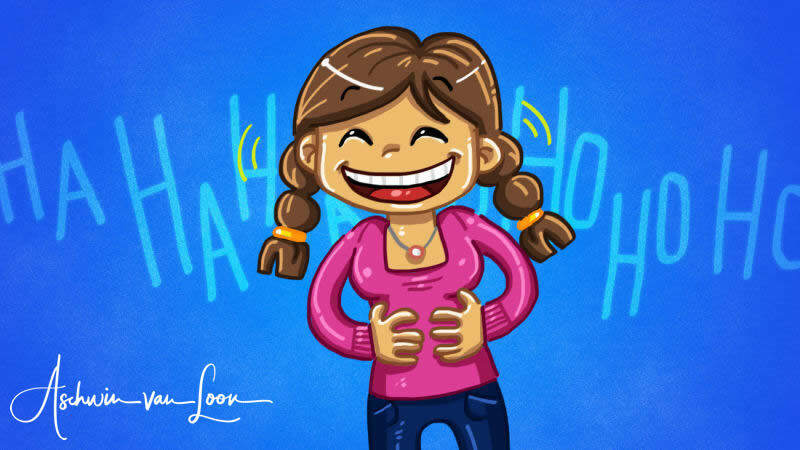 Avoid “canned laughter” for individuals. Practice being funny. Everything improves with practice but it’s important to practice in a low-risk environment first and to build up your funnier self to wider audiences as you improve. Your family and friends will be most forgiving, while a large audience will expect you to be good from the start. Practicing with people you trust and who can give you constructive feedback is a good way to start. Practice callbacks. You may have noticed that many comedians will tell a joke and then bring it back in one version or another, usually getting as big a laugh (or bigger) on the second time than on the first. This is called a callback, and you can use this technique, too. If you come up with a joke or observation that gets a big laugh, subtly bring it back a little later. As a general rule, though, don’t try to call something back more than 3 times. Remember to include non-verbal funny cues, such as doing a funny dance, or making a funny noise, where these are appropriate. Gender matters. Men tend to tell more jokes, tease and disparage (hostile humor), and enjoy slapstick humor, whereas women tend to prefer telling a story, usually in a self-deprecating manner, that elicits a response of group solidarity from other females. Interestingly, the roles reverse when you stick men and women together – men tend to tone down the teasing while women turn it up and target it at men, losing much of their self-deprecation in the process! Remember being funny is all about being yourself, so be sure that your jokes are unique to you. Don’t copy anyone else’s style – people are probably less likely to laugh If they’ve heard the joke before. So try to create your own jokes but even if you use jokes you already know of then make sure its actually funny, harmless and is not a cliché. Enjoy new set of jokes!!! Thank you for the contribution of more humour.